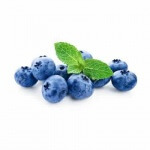 Our exciting new Misty Blue e liquid is an amazing mixture of fruit and minty flavours. An amazing blend of blackcurrant and blueberry, but then with a subtle minty peppermint after taste. If you love fruit flavoured e liquids, but also love our menthol range, this is a without a doubt a flavour you have to try!